Everything but knit, apparently. 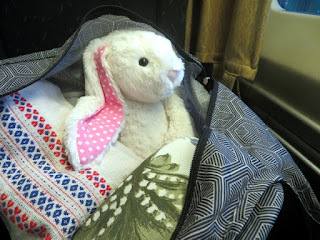 And I started out so well, with a bag full of projects and Strawberry to look after them for me! and home renovation programs: match made in heaven! She must have been too distracted by the view out the window to remember to push them in my direction. I didn't even take pictures of what little knitting I finished on the train. I was a bit self-conscious though - there was another passenger sitting across from me on the train and I'm out of practice not minding if I look a bit obsessive about taking pictures of the yarn in my lap. 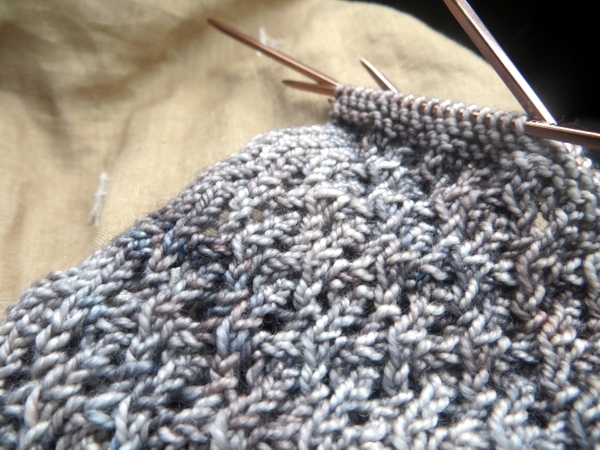 In the end, all I worked on was the second grey glove, because I know a few of you are waiting for that pattern. But I didn't even get to the end of the cuff before I got to my station, because thanks to a seat sale I'd booked in business class and a very nice man kept stopping to offer me snacks and beverages and a delicious lunch. Five hours go fast that way! I wasn't kidding about the lunch by the way. It was cold roast beef which sounds bleah, but it was really good roast beef with teriyaki sauce drizzled over it and soft noodles underneath, with a wheatberry salad on the side and an orange/chocolate biscotti for dessert. On the train!! I would totally travel that way again. On our free evenings, when Pete and I went back to our hotel room to crash out and watch TV, I did work on the glove, and got through multiple repeats of the lace panel. Finally. Our vacation was very restful and unexciting... as I mentioned, we went to Ottawa, where we've been about six zillion times already. It was cold and windy and snowy so we didn't do the walking trails that are a treat in summer. And we've seen all the important buildings and all the galleries and museums except the Diefenbunker, which is supposed to be amazing but also rather far underground and I am pretty sure I would get claustrophobia so it's on the 'Later - much later' list. This time, apart from visiting Bob (he of a sole pair of handknit socks and no hat, because it didn't fit in my train knitting bag) and my godparents and cousin, we visited the war museum for a second, or maybe third? time and learned a few more things, like just how immersed in the war experience children were in the early forties. I mean, we look back at how kids could be frightened by cold war drills and neighbourhood families building bomb shelters in the fifties, but I never thought about how the constant references to war (even down to the military-themed board games and black and white comic books here in Canada that conserved ink) would shape a child's experience of the world in those critical early years of life. You would be as scarred by that as the kids of a generation earlier were by the Depression, wouldn't you think? Anyway, it's lucky that I'm as intrigued by war as Pete is, although we do have different areas of special focus, because that could have been a pretty boring day for one of us. As it happens I am totally fascinated by social history, all aspects of which converge and are documented in wartime. Some of our favourite TV watching dates have consisted of us and Greatest Tank Battles. Do you know this show? The focus on tactical decisions and the graphics that help the lay knitter visualize the scene are helpful, but often, the episodes include interviews with people who participated in said battles - so, human element. The choir we went to hear does an even more gorgeous version than the one I've linked above, but not this time. Eh, the harmony still gives me chills, and I do love this choir too. One thing I appreciate about sacred choral music is that you don't have to be religious to relate to the calming sounds of many human voices joined together. But I digress. 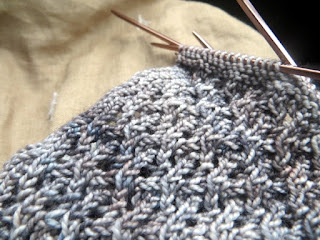 Back to knitting! At the first concert, I ran into my friend Andrea and just happened to have the completed first glove in my purse, so I got her to try it on for a second opinion. She confirmed what I was trying to tell myself wasn't really an issue: the finger end was a little too loose. So I came up with a fix for that. I am so smitten with this pattern. It was a gift from my brain to my hands, honestly - all the complicated structural bits I wasn't sure how to deal with when I came up with the idea just fell into place as I knit. And once I worked out the thumb position and this little detail about the finish at the top, it turned out so well. The gloves are super comfortable, even with all the trailing ends I haven't run in, and the overall shaping is just so tidy. Nothing weird or complicated,and yet it works. Simply and logically. I fear I will be knitting rather a lot of variations on these gloves so I hope you like them too! Okay, back to post-vacation laundry for me, YAY. Hope you had a wonderful few days too and I'll see you tomorrow. Welcome back! I always pack more knitting than I need, too. I'm glad to have your voice in my inbox again! Nice to hear your voice too Laurinda!